The life and times of the venerable Ruth Bader Ginsberg are explored and championed in this ode to the progressive Justice. There’s no questioning it. Ruth Bader Ginsberg has become a bonafide cultural icon in the last few years. As right-wing politics and conservatism begin entering the political realm on a mainstream level, progressive stalwarts like Ruth Bader Ginsberg ensured that there would forever be a dissent voice for the right to hear. With her eloquent speech, fiery passion for women’s rights, and understated disposition, the affectionately monikered RBG has become an inspiration for thousands across the United States who can dream that they too will one day rise from the shores of being labeled an immigrant to societal esteem. Julie Cohen (The Sturgeon Queens) and Betsy West’s (in her directorial debut) charming and affectionate RBG tells the biographical story of the diminutive legal warrior’s rise from her immigrant upbringing in Flatbush and her time as a top law student at Harvard and Columbia to her unprecedented argument of six Supreme Court cases and recent cultural icon status. 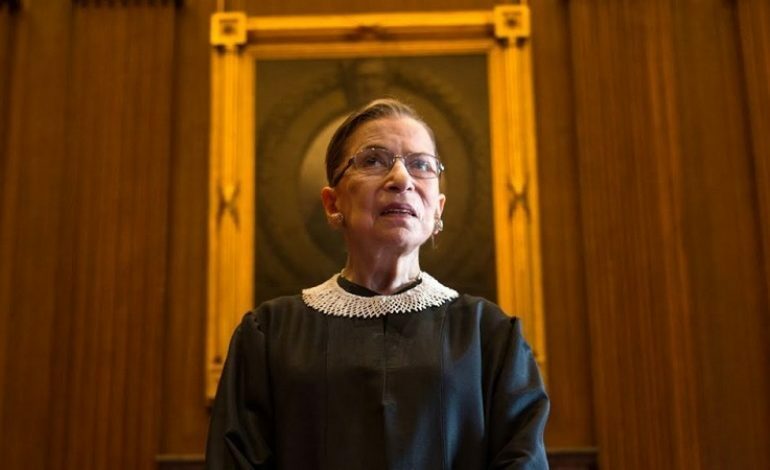 While told in conventional TV documentary fashion (after all, this is a CNN Film production) with the expected onslaught of talking heads and Ken Burns-inspired photography pan shots, RBG does an excellent job of providing a succinct, well-polished look into the oft-overlooked life of a brilliantly fierce lawyer. What’s more surprising than anything is RBG’s extreme poise and calmness, even in the face of extreme adversity and gender discrimination. At one point in time, the unapologetically work-driven Ginsberg was heading the Harvard Law Review, had a husband and baby, was going to law school, taking care of her cancer-stricken husband, and taking notes for him in the classes he was missing due to his illness. Through it all, she remained surprisingly relaxed and composed. And while most would crumble under just one of these tasks, Ginsberg took on these challenges with stride. But Cohen and West quickly move along to focus on her groundbreaking work in helping force law changes that allowed women to finally be independent individuals. From her success in persuading the Supreme Court to grant women the ability to receive equal housing allowance from military service to challenging gender specific legal drinking age laws, Ginsburg often fought for women’s equality in the workplace and beyond. Further than that, Ginsberg also successfully argued for gender equality in the case of males, arguing in one particular case that a man deserves to be compensated for being a widower just as much as a widow. Through the years, Ginsburg proved to be a formidable opponent, one who argued her cases with extreme precision and skilled oral ability, a quality that Cohen and West focus on in the approach to her Supreme Court nomination and eventual appointment. The film uses the nomination hearings as a means of structuring the rest of the documentary, returning to it as an anchor of sorts. It uses the event as a means of creating a web of events, allowing the film to jump back and forth and back again. There is no set chronological structure here (thank God), allowing the film’s subject to wash over its viewers in a sea of amazement. And while the documentary often comes off as ordinary and even pedantic at times, it is nonetheless an important and fascinating film that shines a light on a revered figure in American legal history. But thankfully, the film does more than simply focus on RBG. The documentary uses Ginsberg as a linchpin to explore the larger shifts in sociopolitical ideology on not only the bench of the highest court in the land, but also in America. Whether it be the rising conservatism that had begun taking over the Supreme Court with the appointment of John Roberts and Samuel Alito or the growing lack of moderates in the legislative branch of government, much of Ginsberg’s seminal work was beginning to be undone. But that never stops the tenacious Ginsberg, who often makes her voice heard via her oft-focused on dissenting opinion. But for all her progressive ideological leanings, she is a favorite among many of the conservatives who sit or have once sat on the bench. Whether it was bulwark and former Chief Justice William Renhquist or the hard right leaning Antonin Scalia, many of even the most staunch conservatives had nothing but warm words to say about the sheepish Ginsberg. By including the opinions and thoughts of conservatives, Cohen and West injected a much needed bipartisanship to elevate this film beyond a simple biographical film. But alas, the film seldom left its no-frills profilmic chambers, instead adorning the walls with confetti, balloons, and streamers as a means of adding breadth and life. Unfortunately, it hardly does the job of providing a humanist portrait of what will inevitably be one of the most humanist Justices to ever serve the Supreme Court. 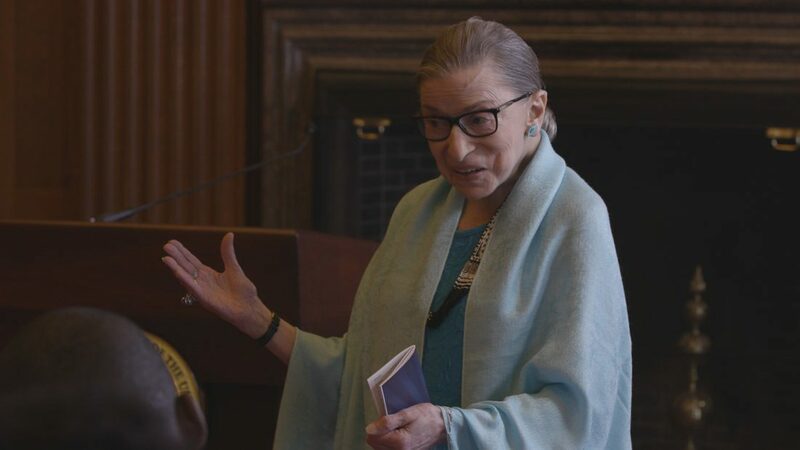 Julie Cohen and Betsy West’s RBG is a well-made and adeptly edited documentary that works tirelessly to elevate Ruth Bader Ginsberg to her much deserved status as a cultural icon. Supported by the recent Notorious RBG moniker that has taken off in popularity, it seems that Ginsberg is entering a new epoch of her life as a social media figure. Nonetheless, the film remains stuck in the drudgery of retelling events and victories, hardly delving into the modernist emotionality that the film (and its subject) so obviously deserves.